Hmm. Didn’t seem too Agile to me, and it didn’t to Esther, either. I run into this problem with organizations quite often, and I’ve found that talking about it doesn’t cause the necessary mental shift. Rather than focus on always doing what can be done to get better (“Evolving”), people often get hung up on all the barriers to being perfect (“Solving”). I was asked to facilitate a day-long planning meeting for an Agile Leadership Group. The team had identified many barriers to adopting Agile at their org, and the sheer number and scope of the barriers were starting to make some of the leadership team uneasy. They didn’t have enough experience in working any way other than as described above, and the energy of Solving was high. I’m a lazy sort, and I hope also a compassionate sort, so rather than debate with the team about their objections or tell them that their fears were silly I thought I’d help them gain some experience… and most importantly, the change of behavior that comes from processing that experience. How to go from "as-is" to "to-be?" It's tempting to treat the transformation as a project and manage it like you manage all your projects: plan well, then execute. 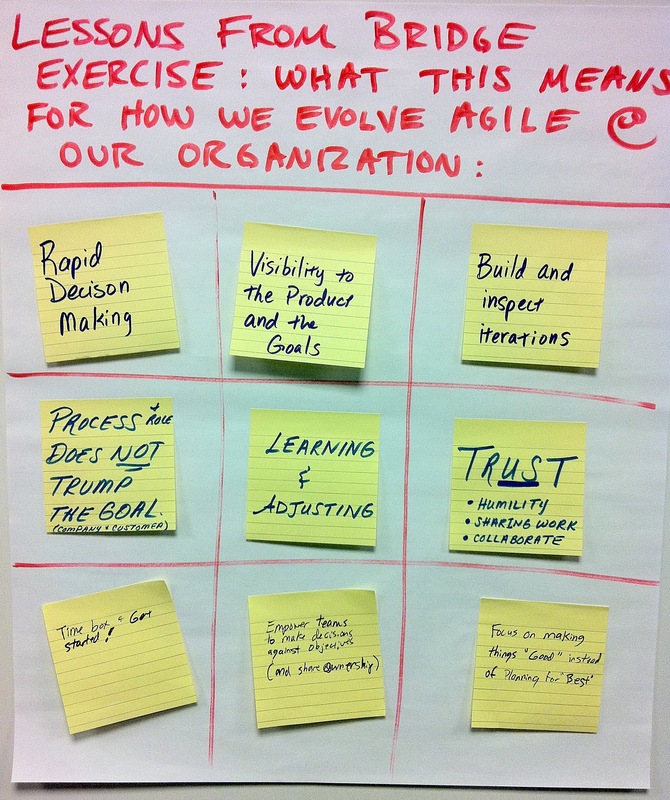 Use Agile to evolve your process just like you use it to evolve your products. Start with what is possible, and iterate across an ever-improving process. Build in visibility mechanisms to allow for inspection. Build in feedback mechanisms to encourage adaptation. Test your process frequently. Instead, it was time to give the leadership some experience in the difference between adaptive/agile work and predictive/deterministic work. I had them break into several teams, handed out sheets of newsprint, and set them a problem. 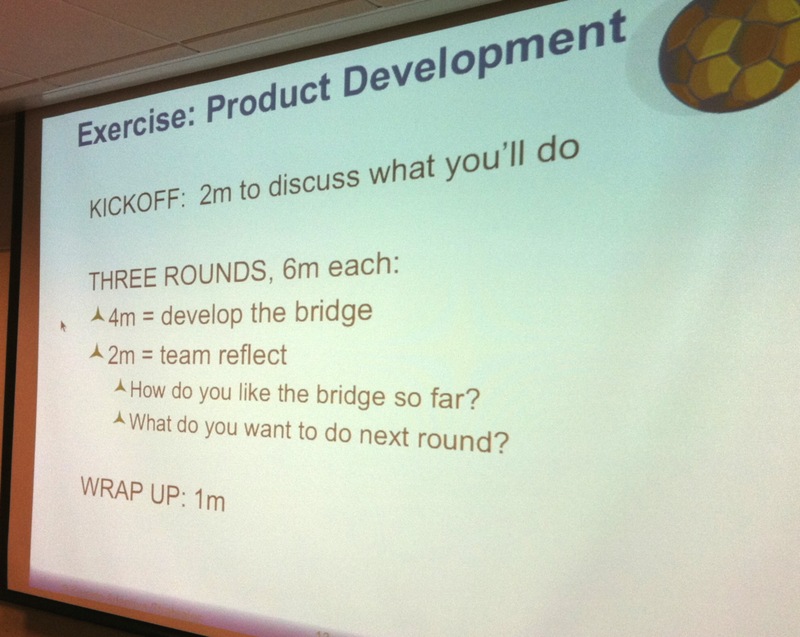 "Process:" The teams had 3 rounds to "build a bridge." Each round included both development (building) and inspection/adaptation. 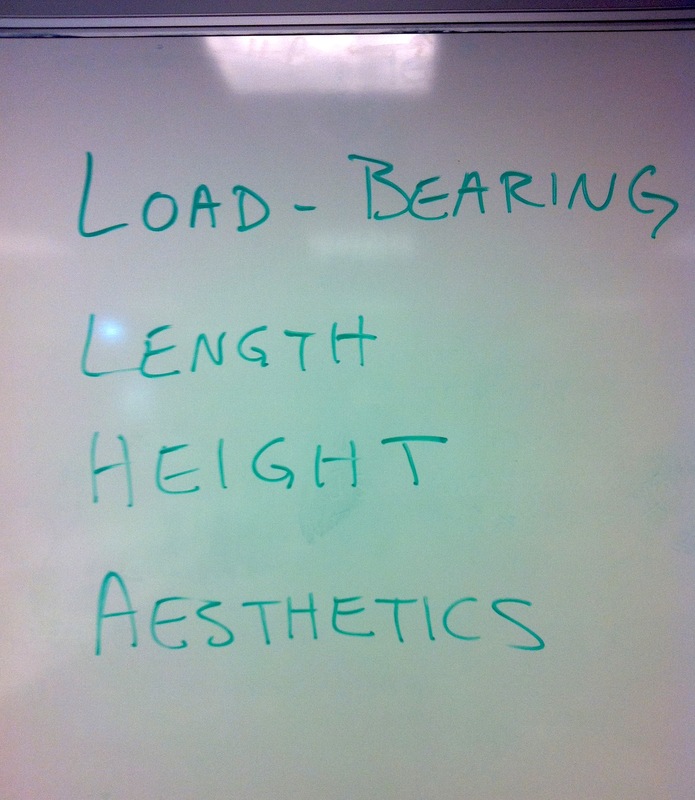 "Requirements:" The teams were asked to "maximize the 4 constraints." A different team starts on their product. Team 1 starts on their outcome. 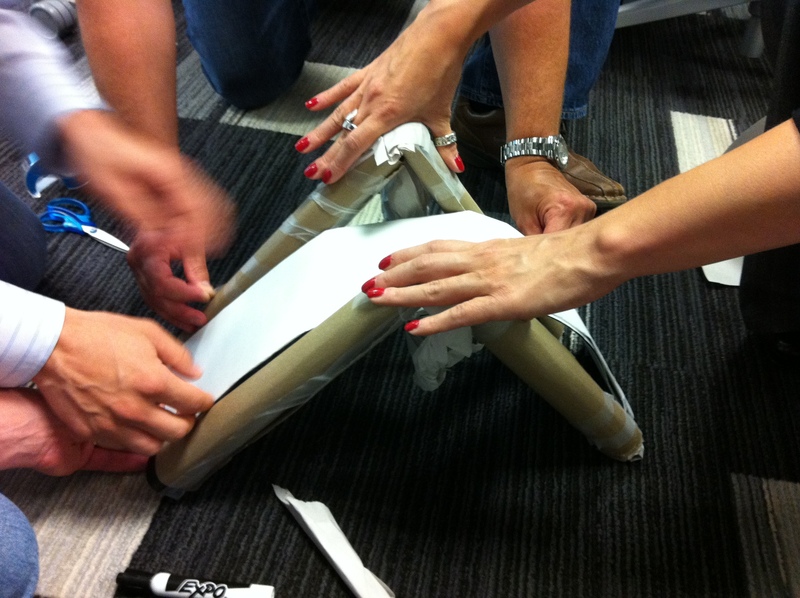 A different team opted also built a sturdy, aesthetic bridge and overcame the "impediment" of "no more paper" by incorporating the cardboard backing into the structure. 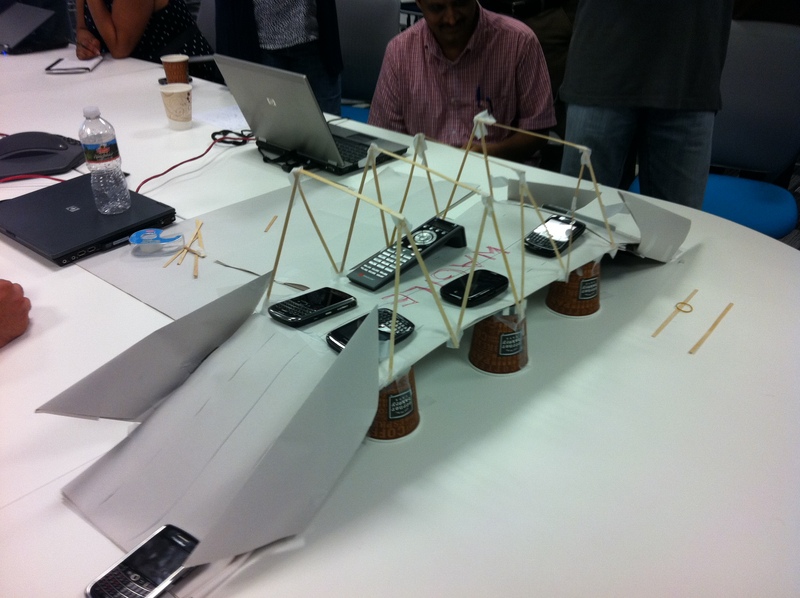 One team made a suspension-type bridge, continuously tested its load with cell-phones, and incorporated elements from the environment. The teams demonstrated their final outcomes to each other, shared a bit of their challenges and successes, and admired each others’ adaptability. Then we sat down for the real mindset-shift. I led the teams through a structured debriefing. This is the part of experiential learning or “games” that is most often neglected, and as a result people have fun but they don’t make the necessary mental shift to enable different behavior. With 3 teams, we handled each step first in small groups, and then each team shared their findings with the rest of the group before moving on to the next step. The teams discussed each step in their groups, and then shared their findings with the other groups. Each team wrote their findings on a flip chart and then shared them with the rest of the group. 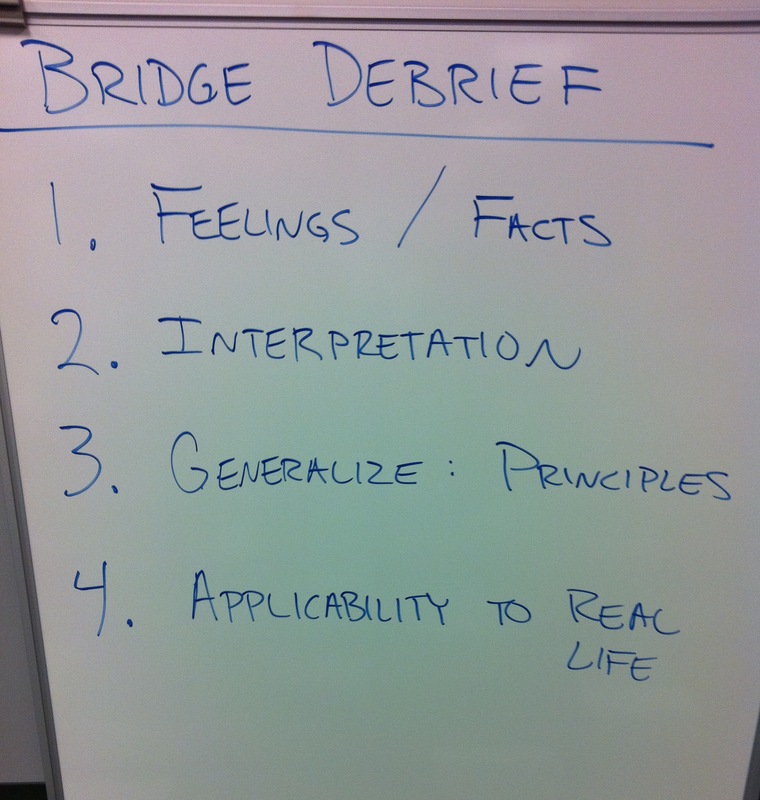 Step 2, Interpretation, allowed the teams to think about the implications of their work on the bridge. Here we shifted from purely observable facts to insights and evaluations: “I noticed that even though we didn’t have a leader, we figured out what to do” and “its funny how those requirements were really open-ended and yet we hesitated about not getting them right.” Most interesting to me were “I think we did poorly because our bridge didn’t match our initial sketch” from one team and “our bridge is different than I imagined it, but it’s actually better” from another. Each team wrote their findings on their flip chart page, posted it next to their “Feelings and Facts” page, and then shared highlights with the rest of the group. But more importantly, it helped make the concepts understandable via a concrete, emotional experience. Debrief Step 3 - Generalization: "How did these concepts show up when you did the exercise?" Once again I had the teams share highlights of their findings with the group, then we moved to the final step: applying these Agile concepts to their work of process change. In Step 4, Application to real life, we tied the learnings from the experience and debrief thus far back to my initial 10-minute presentation about Continuous Improvement vs. needing to solve all barriers up front. 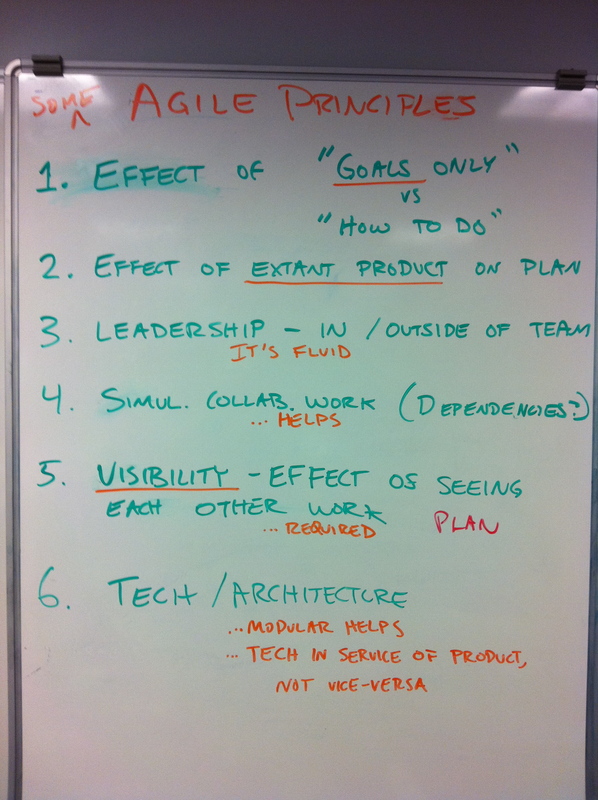 I asked everyone to consider what their principles from Step 3 meant to them for how they would evolve Agile at their organization. Each team then picked their top 3 items and posted them on a common piece of paper (shown above). The outcome of all this was that a leadership team which in the morning had been feeling paralyzed by all their perceived barriers to adopting Agile, had a shared understanding and motivation to move forward by lunchtime. They spent the rest of the afternoon choosing their first pilot teams and projects, and identifying which barriers they were going to tackle first. Wrap-up: The top actions from each of the 3 teams... based on experience. They were able to do this because they learned a set of key Agile concepts directly relevant to their situation, rooted in a shared experience, which they themselves uncovered. So after a day, leadership was ready to rock and we all had a great time. 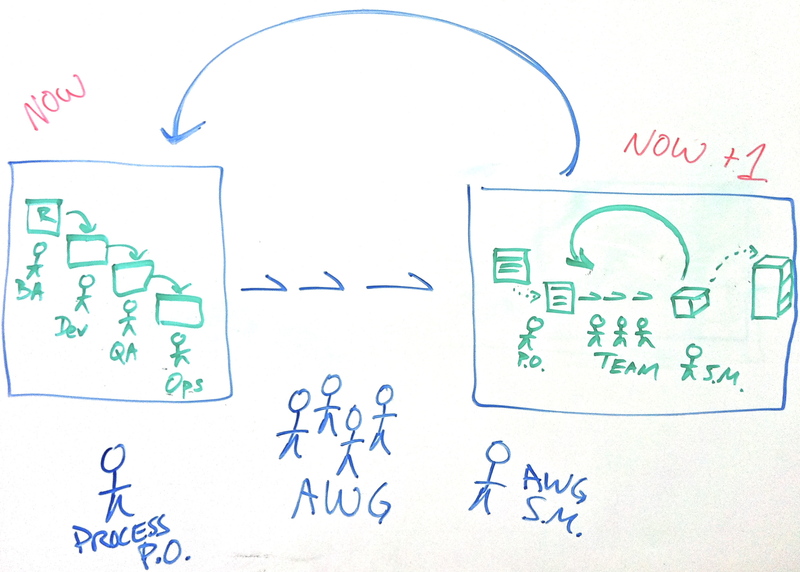 How was YOUR last leadership kickoff about Agile adoption? Very nice workshop, you got right to action on the task of learning. Doesn’t look like you spent much time preparing the group with context of Agile this and that, history, intent, etc. Is that because they mostly already knew this material or do you find it unnecessary to give that context? When did you decide on the debrief’s step 3 “key ideas” used for consideration? Was that pre determined before the exercise via evaluation with the client? 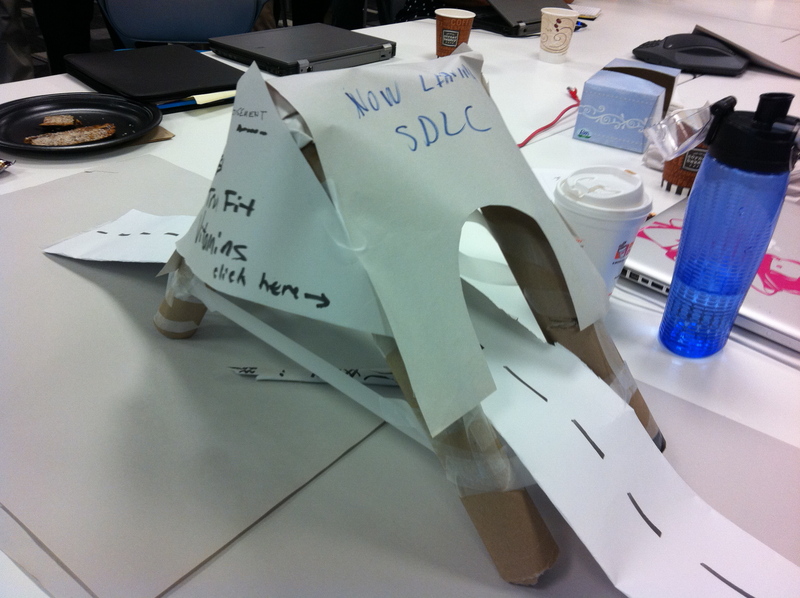 Agile Leadership workshop – no fluff – just get right to learning. Even leaders learn via experience. That was a great post. I really liked that you explained each step with examples from your workshop. It made it feel real, and gave me insight into how I could run a similar workshop. Thanks, David! The last phase of the particular debrief format I used is “application;” how the learnings apply to real life. That part is general. The specific prompt I used for “what does this mean YOU need to do now” was determined from discussions with the client prior to the meeting. In learning, allow any path to be walked, but begin with the end in mind. Andrew, thanks very much for the feedback. Please let me know what happens at your workshop! The UX and the SM Should Be Friends Why Do We Fear Learning?